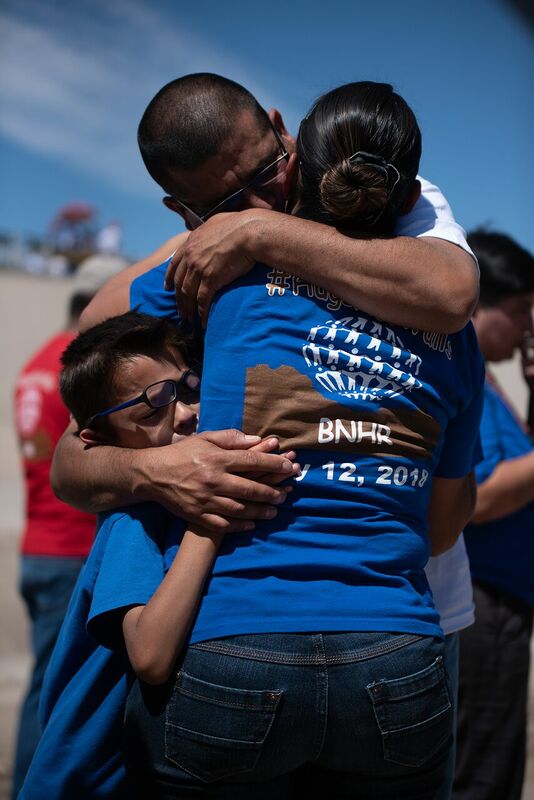 The nonprofit Border Network of Human Rights, dedicated to educating and organizing El Paso, Texas, residents and migrants, holds one of the most emotional events that can be held, each time they are allowed to. It happens on the border of the U.S. and Mexico, and is called “Abrazos no muros” (“Hugs not walls”). The founder and executive director of the organization, Fernando García, announced that they will try to celebrate this October again. It is an opportunity for some families of migrants separated by U.S. immigration policies to meet again, even for a few moments, and embrace each other. García explains that even though the Rio Grande, which separates the American city, El Paso, from the Mexican city, Ciudad Juarez, dries up at some times of the year, they still take advantage of the opportunity to “take the border for a few hours” and allow the momentary family reunion. People hug at the dried up Rio Grande at the "Abrazos no muros" celebrated last May. The activist explains that they have already done five “Abrazos no muros,” in which families have managed to “reunify briefly, to embrace for three, four, five minutes. It’s not a long time, but for us it’s not just an act of love, of humanity, of trying to bring those families together; it’s an act of protest. It’s bringing attention to this crisis that the U.S. immigration policy has generated. That is a crisis that is bursting and destroying the Latino family by the thousands, if not millions. “Seriously, I’m not joking: in the last 10 years families have been busted and separated ... Children separated from their parents by 10 years, for five years, for two years, husbands who cannot be seen, boyfriends who are committed, all of them are separated,” García said, regretfully. He explains that on some occasions they have managed to get some of those couples to marry each other on one side of the wall, “and then they had to return to their sides, to be separated. “With this we want to present to the country the real image of the separation. We will try to do the next one in October, depending on the conditions, of course. That is a thorn in the system that does not want us to do it, but we will try to continue doing it. They continue separating families; we are going to keep unifying them so that they embrace,” the activist asserts. “We have been trying to change that pattern of abuse and institutional behavior that happen on the border, especially against migrants, but also against residents, who are citizens and who also live in this region but who are Latino and are sometimes racially profiled, because of racism on the part of police and immigration agencies,” he says.The Human Rights Border Network has been documenting abuses of authority, police abuses and Border Patrol abuses for 20 years. “Our job is to resist abuse, educate our communities, and organize them also, to fight for changes in laws. It is recognized that migrants are the cornerstone of the U.S., that there are millions of migrants living in the United States without documents and that they have to be recognized as part of society,” García says. Photographer Mónica Lozano has documented several “Abrazos no muros” and explains that one of the things that most attracted her attention at the event was once in December 2017, when the river had water (it is usually dry), so they could not celebrate it at the usual place in the river basin. They had to do it at the border wall. “The wall is made of metal. It was frozen, very cold, but people did not care, and they stuck their faces there in the metal, just to hug the children with their little faces stuck to the metal. Human warmth and the need for connection and to embrace in this icy wall that was all rusted,” Lozano says. The drama of the U.S.-Mexico border is that of an undeclared war that is not new, although the Trump administration has exacerbated it to unprecedented limits by caging migrant children separated from their parents, an infamy that the politicians will not solve, but the common American will. This is what one of the people who knows most about the aberration of the border believes, Fernando García, founder and executive director of the Border Network of Human Rights, an organization that has spent the past 20 years working to educate and organize the residents and migrants of the area. “For 20 years we have been documenting abuses of authority, abuses by the police, abuses by the Border Patrol, and we have been trying to change that pattern of abuse and institutional behavior that happens on the border, especially against migrants, but also against residents, who are citizens and who also live in this region but who are Latino and are sometimes inclined to be racially profiled, because of racism on the part of police and immigration agencies,” García explained in his office, making room for this interview in his especially busy schedule these days. “This border is now one of the most militarized in the world with thousands of border agents, with high-powered weapons, unmanned aircraft systems. All this comprises a war in a country where there is no conflict, in this case with Mexico, but that war is against the migrants, especially during this administration of President Trump,” García said. He describes how the situation on the border worsened with “President Trump’s campaign promise.” As a candidate, “he used Mexicans and migrants in his campaign in an extremely negative way.” He started a narrative in which he said that those who crossed the border were criminals, were rapists and promised not only the wall, “it is important to say that he promised the deportation of 5 million people who lived in this country,” Garcia said. Then after his inauguration, Trump “began ordering his immigration officers on the border and inland to raid across the country, trying to arrest people without documents. But since he does not have the money to get more agents for the raids, he promotes a new policy to rely on local and state police to do immigration work,” Garcia said. García points out that state laws started to pass, as has happened in Texas, where the police are given the authority to ask for papers. “Then Trump’s starting to have his deportation force to include the local police, which should instead be protecting the safety of everyone. Right now in Texas those police officers can request papers under a law called SB4,” he adds. “Also, the National Guard has been deployed at the border. “Even if it is the first time you enter, or even if you come asking for political asylum, you are charged. The truth is that under current immigration laws, crossing the border without documents is an administrative violation, such as running a stop sign or going over the speed limit. However, what Trump is doing is criminalizing the act of crossing further. “It is no longer an administrative matter but a criminal issue. Therefore, each person who passes will be stopped. We will put him in jail and we will prosecute him criminally, García said. “The consequence of this is that complete families are being detained. “Yet Trump is not satisfied. He said, ‘I am going to separate the children from those families who are detained,’ putting the parents in some prisons and the children in other prisons. They did this to try and dissuade other families that are going to cross. It is an inhuman, harsh, aberrant strategy. That is what made this anger rise in the U.S.,” he said. García said that this is not the first time that they have separated the parents from their children and then detained them, when families crossed the border. “This phenomenon of the separation of families has been constant in U.S. immigration policy,” said García, who maintains that it is now happening in a broader context of harsh anti-immigrant policies. But now, “the country discovered that there are children who were in cages separated from their parents,” which, according to García, “touched a nerve in the country and people started to react. There has been a very strong reaction from all sectors of the country to an inhuman policy. “Trump backs down a little bit and signs an executive order, which says, OK, I’m going to reunify them. But it does not stop the zero tolerance program nor the detention of families. The only thing that Trump is proposing is to reunite those children who have been separated, but keep them in jail. They will continue to be in jail, but now, together with their parents,” García laments. “It does not stop there. It turns out that after Trump’s reunification announcement, the administration realized that it does not have a plan, that some parents have already been deported while the children are still in cages and that the administration does not know how to find many of the parents. Parents and children are still in detention. But after having separated them, they do not have an effective system to tie each father or mother with their children. A disaster. One of those bases is in El Paso, Fort Bliss, where it is expected that between 7,000 and 12,000 families will be kept under guard. “Instead of solving it, what he does is expand the detention of families, but now in military centers. How does one see that, having families in military centers? The perception that it may give you is that they are criminals, that they are a threat to national security, when really, they are workers. They are migrants, like when those who came to Ellis Island a long time ago, because that is why they are coming here. “They are looking for a better life,” the activist asserts. García explains that fair immigration reform is needed, starting by legalizing the 11 million to 12 million undocumented immigrants working in the United States. “You have to make them citizens, because that is the tradition of the United States, to implement programs of workers who cross the border legally. We need workers. It is not true that if there is unemployment in New York, New Yorkers will come here to El Paso to pick tomatoes. It is not true. This is only going to be done by immigrant workers. The problem is that now there are not enough visas. There is no worker program that provides them with fair wages and rights even to those that come to work temporarily. There are not enough visas for that,” Garcia said. So people come between the ports of entry to pass undocumented or ‘illegal,’ as they call it. We have to fix the political system, Garcia said. “There is no other option. We have to change it. “But Trump goes in the opposite direction. He does not want those who already live here to be legalized and become citizens, and he wants to cut the legal migration in half. “It is an agenda that has a clear component of rejection and hatred towards Latinos, Latino immigrants, immigrants from the south, because it does not have as much problem with Anglo immigrants. Obviously, this whole policy has a racist tinge. “What we are betting on is that the country, not Trump, the country is realizing that these policies are aberrant. It is going to be the country. They are not going to be even the Democrats, nor any party. It is going to be the country. All sectors of the country are going to realize that it is not possible for the U.S. to defend the policy of imprisoning children, of building walls, of persecuting families. That is not what America, the U.S.A., has been,” Garcia continued. 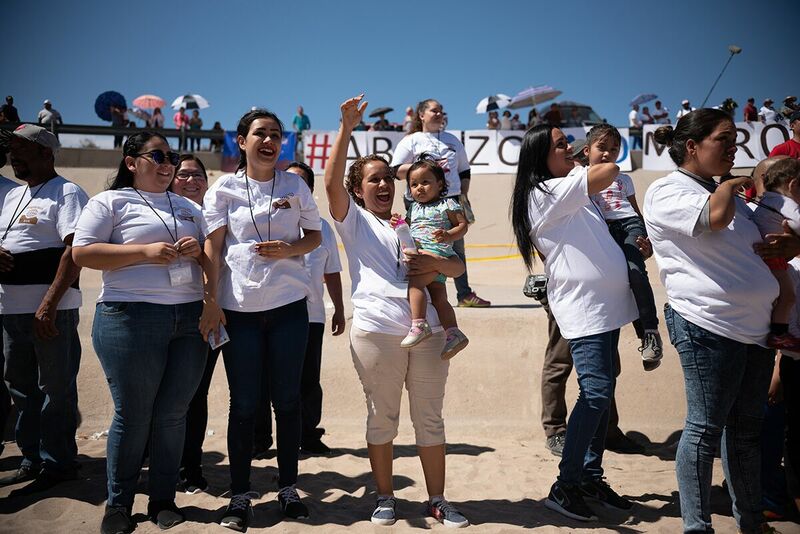 Ralliers took to the dried up Rio Grande at the "Abrazos no muros" celebrated last May. “Are those values we cherish? Is not the unity of the family an American value? Don’t we see Ellis Island and the Statue of Liberty that says, give me your tired, your poor, those who are persecuted, give them to me? This was the idea of America in the 19th century. America was created as a country of migrants, that those who come seeking refuge, fleeing from persecution, find that this is their country, a land of opportunity, the promised land, just as when the Europeans arrived. “This is why these new generations of migrants are coming. This border is the new Ellis Island. The emigrants arrive with that hope. It is eight o’clock in the morning on the American side of the Chihuahuan Desert, El Paso, and a dozen women and some men drink beer in the tavern, The Tap, where they arrived early on Tuesday, June 26 to watch the World Cup match between Mexico and Sweden. “What do I serve you, handsome?” asked Mariana in Spanish. I order some huevos rancheros and coffee. An octogenarian gringo with a cap the colors of the Mexican flag on his head sitting near me sips his beer and belches. “The frog spoke,” says Mariana, this time in English, and everyone sitting at the bar laughs. I just arrived and I already feel like just another local enjoying himself. A Swedish player falls in a match throw. “Shut up, man, do not cry, do not be a mama,” a young girl exclaims. The favorite of the Mexicans is Javier Hernández Balcázar, number 14, Chicharito. When Chicharito touches the ball, Mariana pulls out the maracas. “I would like to be a chicharita to enter through your window, Chicharito,” a lady sings at the end of the bar. I get a message. It is a letter that an immigrant woman detained at the T. Don Hutto Detention Center in Taylor, near Austin, Texas, sent anonymously to the human rights organization Grassroots Leadership last weekend. In the letter, the woman narrates the horror of how she was detained by ICE and separated from her children after passing the U.S. border to seek asylum. The letter describes how she and other women were put in “the kennel” without being able to talk to their children and threatening to give them up for adoption. “I spent eight days in the kennel,” wrote the woman about those first days in custody in which, she said, they did not let her bathe and “punished them and did not give us water or food. We slept on the floor and they gave us aluminum foil to cover us. My son says he was beaten where they had him for three days.” She wrote, “My daughter was pulled by her hair just because she did not get up.” The woman explained in the letter that it took her 21 days before she could speak with her children. California Federal Judge Dana M. Sabraw of the San Diego federal district court issued a nationwide order on Tuesday, June 26, ordering all families of immigrants separated at the border to be reunited within 30 days. The order states that children under 5 years of age must be delivered to their parents in 14 days and that all minors must be able to speak with their parents in 10 days. “The unfortunate reality is that under the current system, migrant children are not counted with the same efficiency and accuracy as property,” the Judge wrote in his order. The deadline for that court-mandated order came and went on July 26. During today’s game, the beer at The Tap costs only one dollar and they give away tacos and shots of tequila. But the second half started badly, and the locals yelled that the Mexicans were playing like little ones. When the Swedes score the second goal, a man in the corner jokes: “I’m going to work.” But another beer is requested. From far away, the World Cup held in Russia is felt on the border of Texas. At a recent protest march in El Paso over “zero tolerance” practices and the constantly-changing immigration policy of the Trump administration, there were plenty of green shirts of the Mexican World Cup team among the protesters. On Monday, June 25, the authorities allowed the press to enter the Tornillo Detention Center, 39 miles from El Paso, where 326 children remain in custody, according to reports. María is sitting next to me proudly wearing the colors of her country. She has not seen her three children, who live a stone’s throw away in the adjoining Ciudad Juárez, in the past five years. They are older now. They are 31, 28 and 19 years old. She raised them here in the U.S., working with a visa in El Paso for 20 years, but then she lost the work visa 5 years ago. They took the visa away because she could not handle the paperwork, she told me. When her visa was taken, she owed $12,000 on the house she had bought in Ciudad Juarez, and, in order not to lose it, she returned to El Paso to continue working, this time undocumented. “They charged me only $500 to cross” the border. María wanted to pay off the house in a year, but things got complicated. She now has two grandchildren she does not know in person. She cried as she told me that she has recorded their voices on the cell phone to listen to. She works Monday through Saturday cleaning houses for $50 a day. She arrives home at night and tries to maintain a routine. “I exercise, I bathe, but one comes home and the loneliness is horrible ... I take refuge in this,” she said looking around the bar. “I came here to take my children forward. I do not want a man for the papers. I’ve never prostituted myself,” she says proudly. She then told the story of two friends who married citizens for papers. One ended up in a shelter for abused women and the other in a small room in the back of the husband’s house. Sweden scores the third goal. “Will you give me a gallon of beer to go, please, to go and cry?” exclaimed a patron. In the end, Sweden wins. But Mexico will go on to play another day.